My mother-in-law is one of the biggest kitchen gadget fans that I know of. So much so that she became a kitchen rep for a highly respected brand of cooking gadgets. For years she would drive all over town and demonstrate to groups of giggling women the “must have” cooking gadgets of the season. She would demonstrate how the Pineapple Wedge-er is essential when slicing a pineapple or how the Egg Slicer is actually an Egg Slicer “Plus,” and how these kitchen gadgets would greatly help out in the kitchen and make their lives easier. Ironically, I don’t ever use them. Not because they are not useful, it’s just that when you learn how to use a knife, most kitchen gadgets get demoted to the “er” drawer. The “er” drawer is something we all have in our kitchens. The place for the pizza cutt-er, the mash-er, the melon ball-er, you get the idea. My personal favorite the “Bamboo Tong Toast Grabber,” which I actually did use for grabbing a small piece of toast that was stuck in my toaster- thankfully I had my Toast Grabber to help me out! Depending on the type of cook you are will determine what your “er” drawer contains. I’m not saying all anyone ever needs is a knife to cook with- hardly! I’m just talking about some of the crazier kitchen gadgets that perhaps you will try out once and then demote to “er” drawer, or the garage sale box or pass off as a cool bath tub toy for your nieces and nephews. In all seriousness, there are several cooking tools that I cannot live without. Ask any chef and they will admit the same. Better yet, ask to see their knife bag or tool box- you might just be amazed at what chefs carry around with them. It’s not a whole lot- more like the necessities. When it comes to special luxury tools that truly make my life easier, there are more than a couple that I would spend the money on, like my cherry/olive pitter or my mandolin slicer. The beauty of kitchen gadgets is that everyone cooks differently, thank goodness, and everyone uses different tools. My mother uses her garlic press on a weekly basis, and my father uses an apple corer/slicer everyday and my husband swears by this hand chopper gizmo that we have. To my mother-in-law’s defense, she told me the real reason she started selling kitchen gadgets was to get people interested in cooking for their families. She felt there were just too many people that didn’t sit down at the table together for meals anymore. If she was able to get people excited about a nifty little garlic press or an avocado peeler, then she had reached out to a couple people who might be inspired to cook with it that night for their families or at the very least, add it to their “er” drawers. 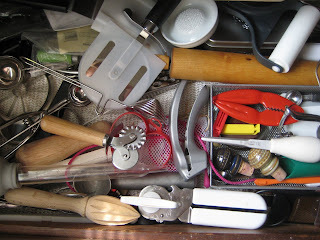 I, too, have an '-er' drawer full of stuff I don't use very often because, as you wrote in your post, a chef's knife does the job better. Nice post. Hope to meet you at the IFBC next month.